The Czech company Tatra was founded in 1850 to build horse-drawn carriages, but would go on to produce some of the most brilliantly eccentric passenger cars ever seen in the twentieth century. The genius behind them was designer Hans Ledwinka, who began building backbone-frame two-cylinder cars, then delivered his masterpiece the T-77 in 1934. The streamlined six-passenger T-77 sedan was powered by a 3.5-liter, air-cooled, overhead-cam aluminum V-8 engine mounted in the rear. Suspension was by torsion bars up front with swing axles in the rear. A huge vertical dorsal ran down the car and vents on the tail directed air into the engine, so rear visibility was minimal. The more rounded T-87 followed in 1937, and the basic design was heavily copied and downsized by Ferry Porsche for the Volkswagen. After the Second World War, Germany paid the Czechs three million deutschmarks for patent infringement. Ledwinka was imprisoned from 1945-51 for collaboration with the Nazis, but his deputies led by Julius Mackerle created the four-cylinder T-600 Tatraplan T-600. It was built from 1948-52, using the same floor plan design as the T-87, but lighter and smaller, and it was powered by an air-cooled, 1,952 cc, flat four-cylinder of 50 bhp, giving a top speed of 80 mph. The engine is shrouded to assist fan cooling, with a downdraft carburetor on each side. In all 6,342 T-600s were built. 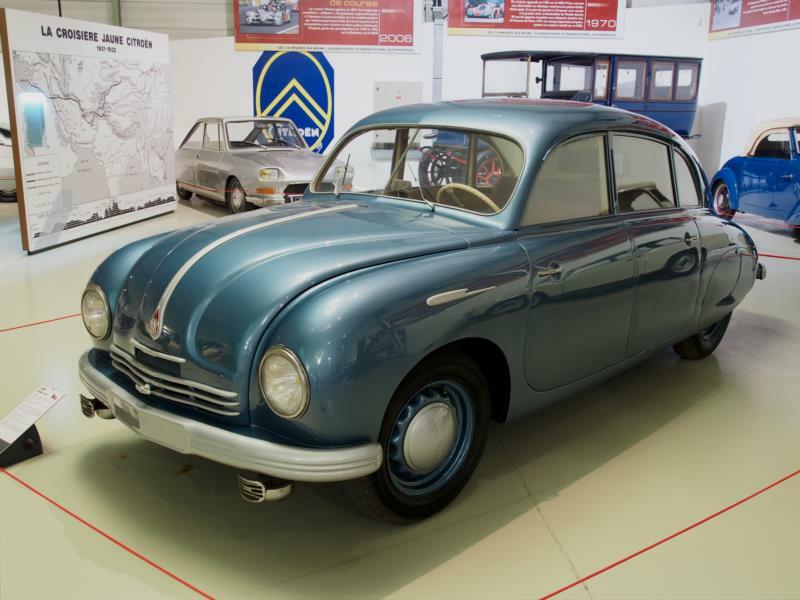 The first 2,100 were made at the Tatra works and the rest at the Skoda factory in 1951-52. Unfortunately, the Czech government decreed in 1951 that Tatra would have to concentrate on trucks. All the Skoda-built cars were exported, but few T-600s came to North America, with estimates are as low as 168. Another 50 are known to have been shipped to Canada as part of a wheat deal, and survivors occasionally surface there. The T-600 is a teardrop-shaped four-door sedan, with both sets of doors hinging on the central pillar. There’s a luggage compartment in the front, along with the spare wheel, and another behind the rear seat, isolating engine noise from the passengers. The flat floor plan and torsion bar front suspension will be familiar to any Volkswagen owner, as will be the air-cooled, flat-four engine and the swing-axle rear suspension. The bodies were well-built and most surviving cars have been driven relatively few miles, owing to the dearth of spares. Volkswagen drive trains have been transplanted, though the displacement is significantly less, and a Corvair refit would be possible as well. The value of original cars is climbing, however, so such transplants are now a poor financial decision. Luckily, the internet and the opening up of the Eastern Bloc has made more spare parts available, though bodywork and trim are still challenging.